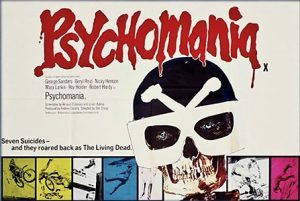 This week, a look at the odd British cult horror, Psychomania. Tom is a shaggy-haired and quite amiable psychopath and the leader of a violent British teen gang, a la the Droogs from A Clockwork Orange. Tom barrels around on his motorcycle with his girlfriend and loves his doting mother. 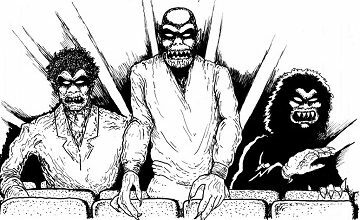 The gang, The Living Dead, dabble in black magic. Meanwhile, in a similar vein, his mother and her sinister butler Shadwell get their jollies out of holding seances in their home. With her help (and following in his deceased father’s footsteps) Tom returns from the dead, after driving his bike into a local river. One by one, he and his fellow bikers commit suicide with the goal of returning as one of the “undead”.